Are more mental health patients dying from suicide? Deaths by suicide in Northern Ireland in 2010 were the highest figure on record. MORE than 220 people known to mental health services died in suspected suicides in Northern Ireland over a two-year period, The Detail can reveal today. The figures – which relate to deaths which occurred between April 1 2009 and September 30 2011 – were released to The Detail by the agency tasked with health service oversight, the Regulation and Quality Improvement Authority (RQIA). The death toll appears to indicate a dramatic increase in suicide deaths of people suffering from mental health problems compared with statistics collected between 2000 and 2008 as part of a national confidential inquiry. The UK-wide National Confidential Inquiry into Suicide and Homicide by People with Mental Illness looked into suicide deaths which took place over the eight-year period and was carried out by a team of researchers at The University of Manchester. The suspected suicide of anyone known to mental health services during the previous two years must be reported to RQIA by the health trusts as a serious adverse incident (SAI). The confidential inquiry figures were sourced from the Northern Ireland Statistics and Research Agency and focused on suicides of people with a history of mental health service contact in the 12 months before their death. Of the 1,865 people who died from suicide in Northern Ireland during the time fame of the confidential Inquiry, 533 had had contact with mental health services in the previous 12 months – an average of 59 per year. As well as those who take their own lives, it is estimated that around 13,000 people present with self-harm in accident and emergency departments in Northern Ireland every year. The Suicide Prevention Strategy for Northern Ireland – Protect Life – was launched in October 2006 with the overall aim of reducing deaths by suicide. It’s proving a tough battle. 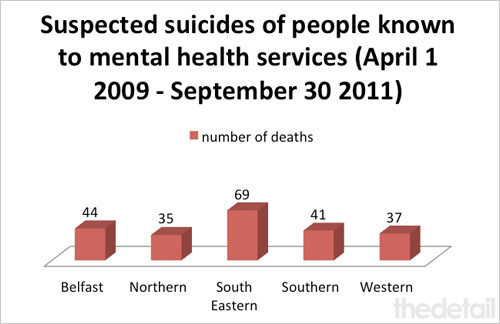 There were 313 suicide deaths registered here in 2010 – the highest figure on record. Today we report on two families’ stories – click here. One mother has been battling to secure support for her suicidal daughter. She claims her daughter’s suicidal tendencies are not taken seriously because she has been diagnosed as having a personality disorder diagnosis, despite numerous self harm and suicide attempts. And we speak to a Belfast man about the death of his son by suicide seven years ago. Danny McCartan, who had been suffering from mental health problems, pleaded to be admitted to hospital the day he took his own life. Serious Adverse Incident (SAI) reports carried out by health and social care trusts following recent suicide deaths in Northern Ireland have also been released to us in a response to a Freedom of Information request for copies of all SAI reports submitted to the Department of Health between May 2009 and April 2010. The department initially refused to release the documents but this decision was overturned when we asked for an internal review. The SAI reports were then released to us in full – with confidential information only redacted. We summarise some of these reports today. There has been a requirement from July 2004 to report serious adverse incidents within the healthcare system. They can be submitted by staff working in hospitals, community/social care and family practitioner services. The incidents are those serious enough to require regional action to improve safety, or be of major public concern or require an independent review. SAI reports are not routinely made public. We have already reported on SAIs submitted to the Health and Social Care Board after April 2010 as the HSCB released these documents to The Detail last year without us needing to resort to an internal review – click here to read this story. Before 2010, the reports were submitted directly to the department. On April 1 2009, the Mental Health Commission was dissolved and its functions transferred to the Regulation and Quality Improvement Authority (RQIA). The authority has established a dedicated team responsible for inspecting and reviewing mental health and learning disability services across Northern Ireland. A spokesman for the RQIA confirmed that authority had received 226 SAI reports from the health and social care trusts between April 1 2009 and September 20 2011 relating to suspected suicides of people known to mental health services during the previous two years. The spokesman stressed that the issue of suicide is of particular concern to all health and social care services in Northern Ireland. On receipt of an SAI notification RQIA inspectors conduct an initial assessment of the case, and where necessary escalate issues of concern to the health and social care board. When the full report on the incident is received RQIA inspectors review the report to determine what further action may be required and to ensure appropriate learning from an incident, both locally and across Northern Ireland. A Northern Ireland report was written by the national confidential inquiry research team. Overall, they found that the annual suicide rate here is higher than in the United Kingdom as a whole, though lower than Scotland. The report states that 29% of the 1,865 suicides which occurred in Northern Ireland between 2000 and 2008 were of mental health patients – which corresponds to 59 patient deaths per year. The researchers say that young people should be a priority for suicide prevention after finding that 332 suicides during the eight year period were aged under 25 – 37 per year. Young mental health patients who died by suicide tended to have high rates of drug misuse (65%), alcohol misuse (70%) and previous self-harm (73%). Northern Ireland Hospital Statistics also provide information on mental health treatment and provision. Between 2006/07 and 2010/11 the total number of inpatients admitted under the mental health programme of care decreased by 23% while the number admitted as day cases almost trebled. Over the same five year period the average available mental health beds in our hospitals decreased by 24% (from 1,078 to 821) between 2006/07 and 20010/11. In 2010/11, there were 1,066 compulsory admissions to hospitals under the Mental Health (NI) Order 1986 – a third of these (333) were in the Belfast Health and Social Care Trust. The hospital statistics for 2010/11 show that mental health patients missed a total of 3,789 outpatient appointments during this period. This is a ‘did not attend’ rate of nearly 23%. A total of 1,740 outpatient appointments were cancelled – 12%. The national confidential inquiry found that in 129 of the patient suicides (27%) in Northern Ireland it investigated, patients had missed their final appointment with services. However, the blame for missed appointments doesn’t just lie with the patients. The hospital figures show that hospitals also cancelled 3,209 outpatient appointments which equates to a hospital cancellation rate of 20%. The importance of showing up for appointments can be seen in the SAI reports we received. Some of those who died and were known to mental health services had failed to show up for appointments prior to their deaths. The RQIA raised the issue of missed appointments with the Department of Health in 2009. This resulted in the department highlighting to the health trusts the need to “proactively and as a matter of urgency follow up missed appointments and those clients disengaging from services”. We asked the authority if it is happy with how these issues are now being handled. In response to our FOI request, the DHSSPSNI also released a report which summarised the key themes and learning arising from the 1,023 SAIs reported to the department between April 1 2007 and April 30 2010. Around a third of the SAIs involved the death of a person and 45% of these deaths were suspected suicides involving people who had contact with mental health services in the two years preceding the incident. There were also suicides of several women with post-natal depression. Among the documents now released by the DHSSPSNI are the many SAI reports which followed suicides and attempted suicides of people known to mental health services. They include cases of patients missing hospital appointments prior to their deaths and others where people had been discharged from hospital and went on to take their own lives. Some people who were receiving inpatient treatment also took their own lives. A common conclusion from the incident review is the claim that the deaths were unexpected and could not have been predicted by staff. In some cases, the suicide occurred without warning. But other cases make disturbing reading. • One man within the Belfast Health Trust area appears to have taken his own life just three days after discharge from hospital following a serious self-harm incident. When he was admitted he informed staff that he intended to kill himself when he was discharged from hospital. His mood improved and it was judged that he was not ill enough for hospital admission and also did not require any intensive input from the Crisis Response Home Treatment. He later died from hanging. • Another man was found hanging in the grounds of a hospital in the Northern Trust area where he was being treated as an inpatient. • In the Belfast Trust area a woman is thought to have died by suicide as a result of post-natal depression – 12 weeks after giving birth. A health visitor had visited on three occasions but there were also five “no access” visits to her home. A test by the health visitor showed the mother was borderline for probable post-natal depression and she was advised to visit her GP. On her next visit, the health visitor was informed that the patient had taken her own life. More on the reports above and other suspected suicides in Northern Ireland can be read here.